Apparently, Virginia is for Wine Lovers. When we first read about Alexandria’s First Annual Food and Wine Festival, we mentally scanned our closet trying to select the perfect outfit for this day of wining and dining. The festival will feature reds and whites from numerous Virginia wineries, as well as bites from local spots, including The Chart House, Clydes and Indigo Landing. John Carlyle Square will be the center of the action, with drinking, noshing, and even dancing, as the night goes on. The key to an outfit for the perfect outdoor day? Undoubtedly, it's a comfortable shoe — nothing ruins a good wine sampling like a blister. To go with our kicks of choice, we are particularly thankful for summer’s bold patterns — you know, the kind we can count on to camouflage any vino we might accidentally spill (we’ve mentioned we’re klutzy, right?). 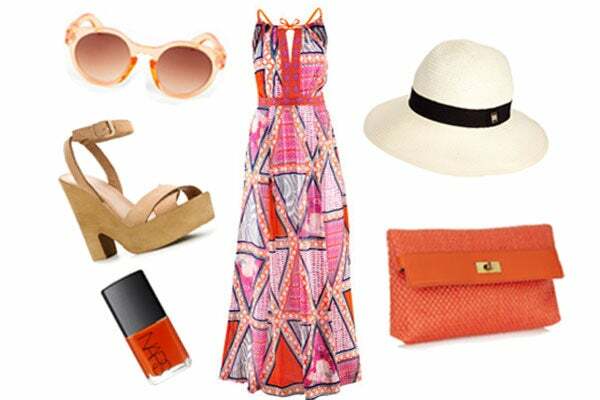 When: Saturday, June 23, from noon to 5 p.m.
Thakoon for NARS Nail Polish, $18, available at NARS; Zara Wooden Wedge Shoe, $99.90, available at Zara; Tegan Peach Sunglasses, $12, available at Tobi; H&M Maxi Dress, $19.95, available at H&M; River Island Fedora, $24.86, available at ASOS; J.Crew Raffia and Leather Clutch, $130, available at Net-A-Porter.